Of course this title includes young female heroes, too, and the range of people covered is amazing. Some people featured are now well known: cricketer Sachin Tendulkar, Formula One driver Max Verstappen, cellist Yo-Yo Ma and gymnast Nadia Comaneci were all young for their first achievement. Mark Zuckerberg was 12 when he connected all the computers in his home to ‘ZuckNet’, and in his teens when he invented ‘Synapse’, a program to remember a person’s musical preferences and make suggestions- he had job offers from a few tech companies, but decided to go to Harvard to study further, and the rest is history. Others are less familiar: Lily Born was 8 when she noticed her grandfather having difficulty holding a drink with tremors caused by Parkinson’s disease, and she invented a cup with legs, which was eventually produced as the Kangaroo cup and is useful in other ways, e.g. keeping a drink upright on grass or sand. Mikaila Ulmer was only 4 when she started making and selling ‘Me and the Bees’ lemonade, to raise money to help save bees. Artist Kieron Williamson was 6 when he sold his first ‘mini-Monet’ painting of Norfolk countryside, and his art is now in huge demand. One young man with huge potential is Dutch teenager Boyan Slat, who disliked diving in plastic, and began to work on removing plastic from the world’s oceans. By the age of 18 he had a plan which no-one believed would work, but he gave a TED talk which went viral, and offers of help flooded in - now his company, Ocean Clean-Up, aims to reduce the Great Pacific Garbage Patch to half its size within five years, to progress to the other garbage patches, and to keep the oceans clear of plastic. Much is made of the difference that one person can make, no matter how small it may seem at the beginning. Malala is here, of course, but so is Brandon Green, who at the age of 16, representing Yorkshire and Humber, spoke about improving public transport at the UK Youth Parliament, which is an annual event allowing young people to speak on the issues that affect them. He continues to work with the Barnsley Youth Council. Lula Bridgeport points out that this opportunity is open to anyone, and also on few double-page spreads gives ideas on how young people can make an impact if they have enthusiasm and commitment, but also how to be a hero every day in their local community or school, by being kind and helpful, and getting involved. The three artists have recognizable different styles, but because of the different areas of coverage, this does work. Some people are featured in single or double pages, and others are put together as part of an overview of a section, e.g. STEM, Sport, Environment, Politics and Activism. 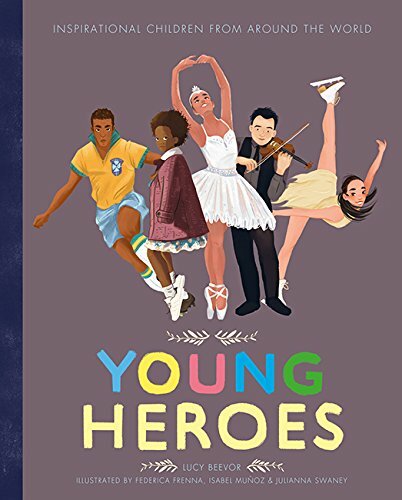 These books about achieving people, especially recently those on women and people of colour, have been an encouraging trend in publishing for young people. Evidently it’s cheaper to use artists’ impressions rather than photographs, and the price is indeed very reasonable, but the sketches do look like the people they portray- your reviewer has checked a sample. This is a fascinating book to dip into, or in which to look up your own area of interest, and there are links to further investigation as well as a comprehensive glossary of possibly unfamiliar words.